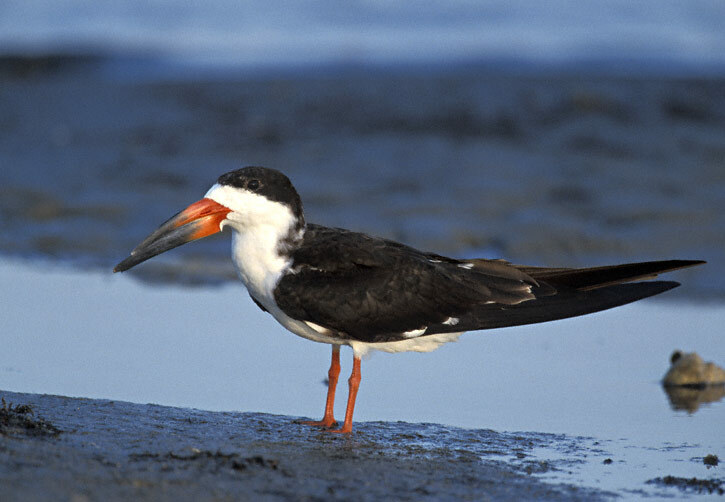 The Black Skimmer (Rynchops niger) is a widespread bird of the coastlines of the United States as well as much of Central and South America. 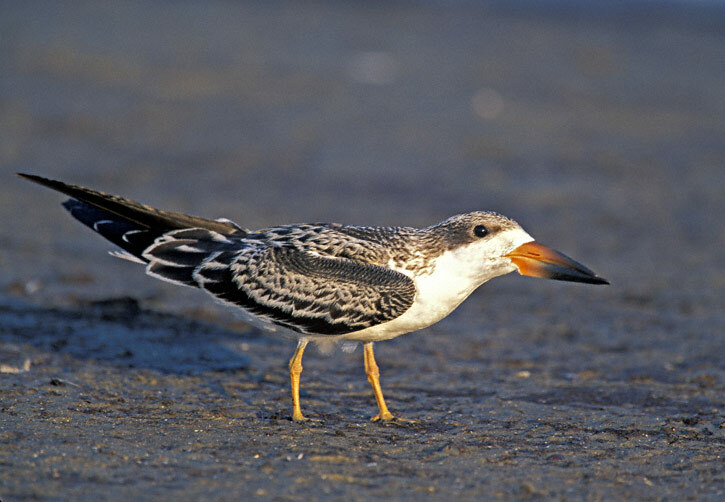 The species also goes up major rivers away from the coasts in some areas. 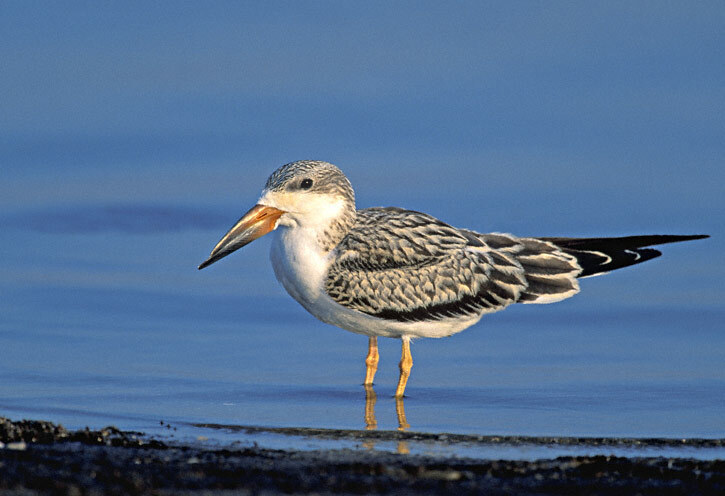 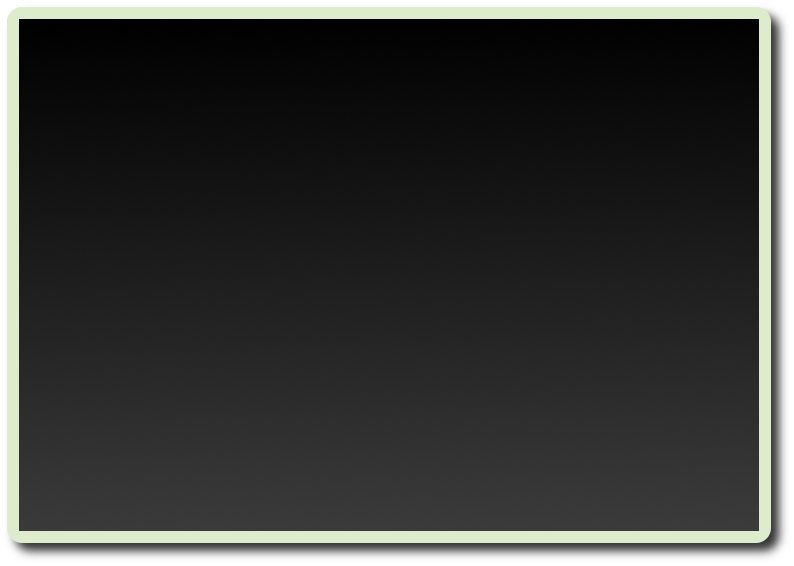 This is the only species of bird in America with a lower mandible longer than the upper mandible. 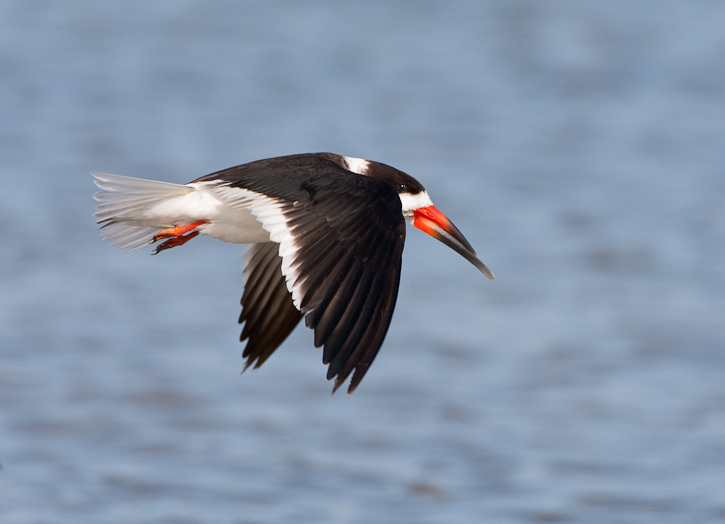 Black Skimmers feed by flying just above the water's surface and letting their lower mandible cut through the water like a knife. 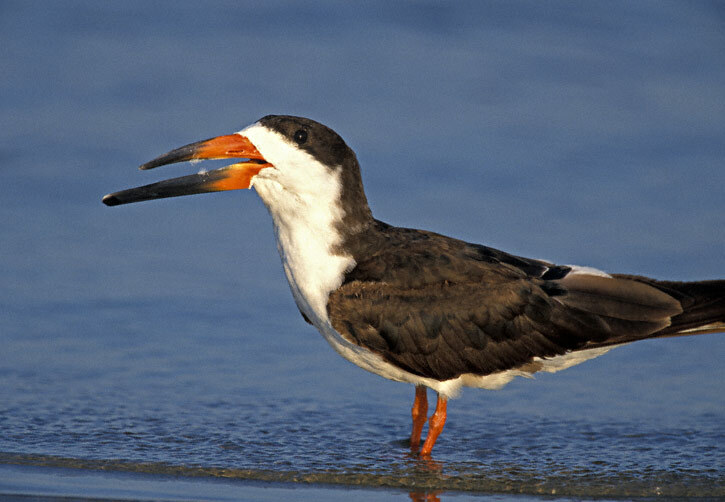 When a small fish or other food item is caught, the bird quickly snaps it head back to swallow, then again lowers its bill into the water. 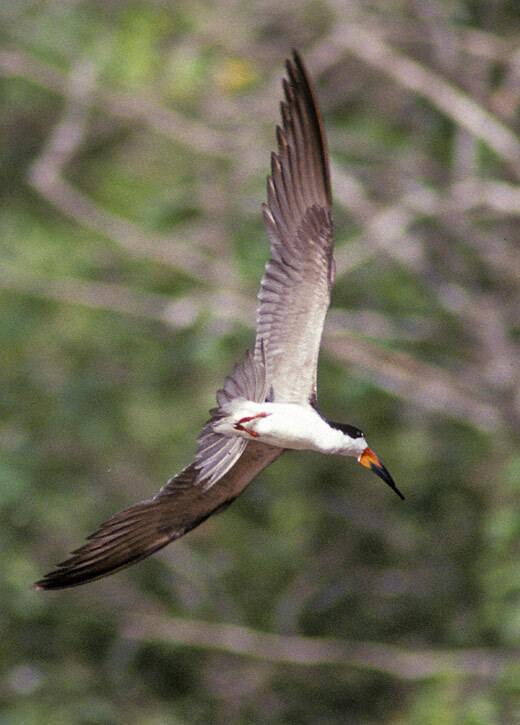 The shot on the immediate left shows the underparts of a Black Skimmer as he flashed past me along a small river in Apure, Venezuela in April, 1992. 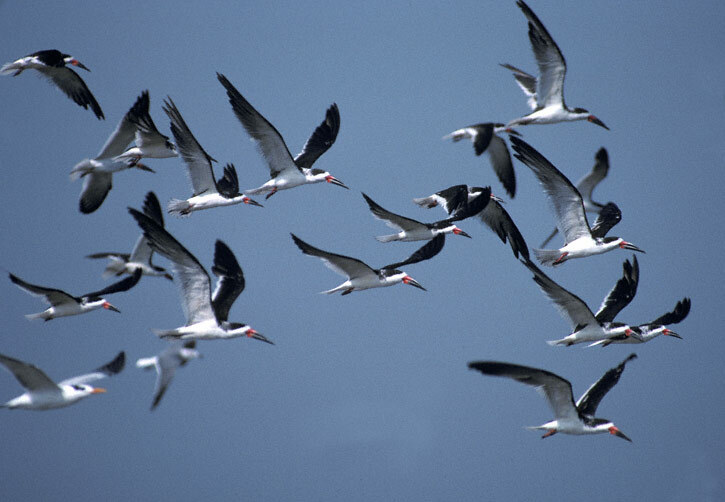 The shot was taken with a Canon T-90 and FD 400mm F/4.5 lens on Kodachrome 200 film. 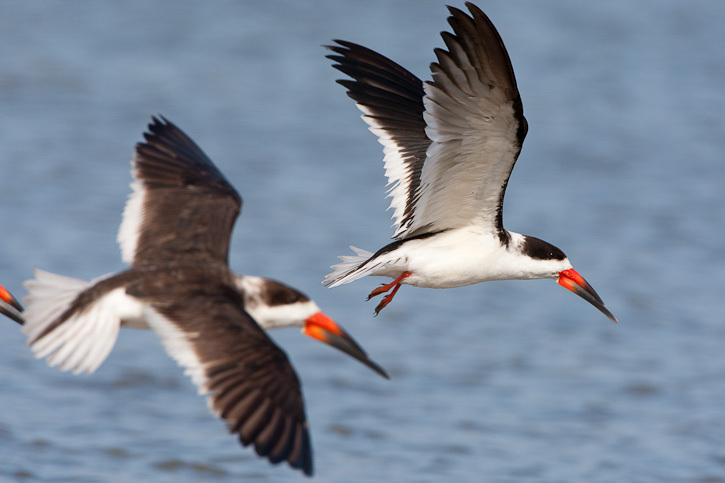 The Black Skimmers in flight shown here were at Bolivar Flats, Galveston Co., Texas, in October, 1992. 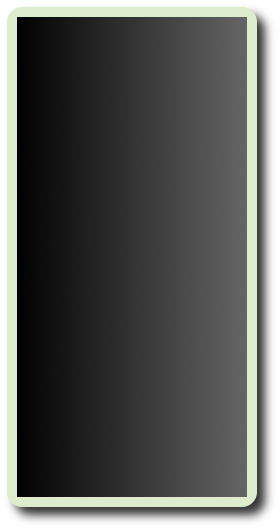 This shot was taken with the same film and equipment as above. 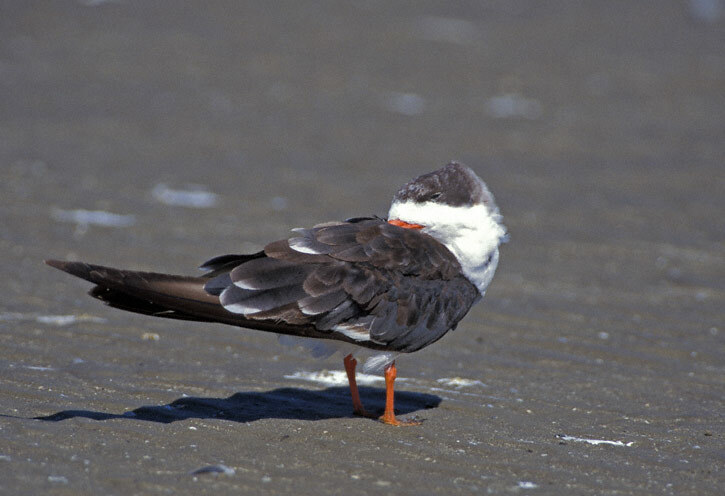 The sleeping Black Skimmer at right was photographed in Galveston, Galveston Co., Texas, in October, 1998. 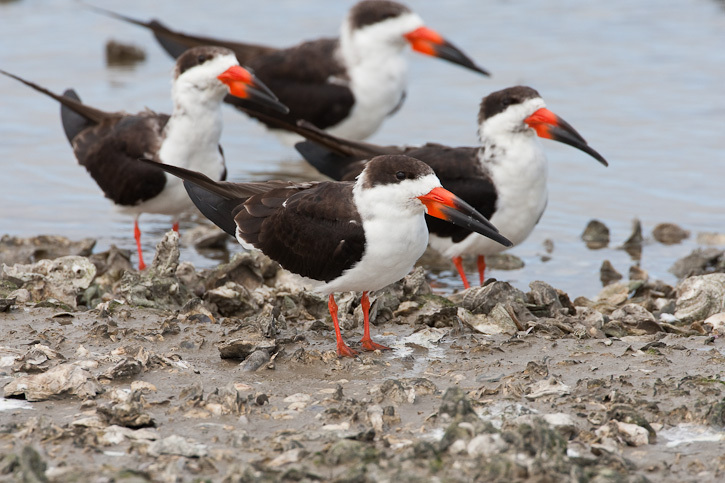 The next four shots of two adult and two juvenile Black Skimmers were all taken in September, 1999, at San Luis Pass, Galveston Co., Texas, with a Canon EOS 1N and EF 300mm F/2.8 L lens and 2X extender on Fuji Velvia film. 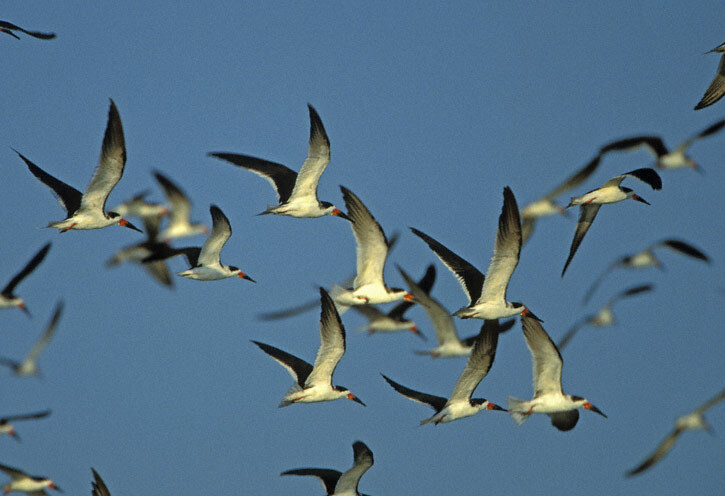 The flock of Black Skimmers in flight shown here was taken in March, 2001, at Bolivar Flats, Galveston Co., Texas, with a Canon EOS 3 and EF 500mm F/4 L IS lens on Fuji Provia film. 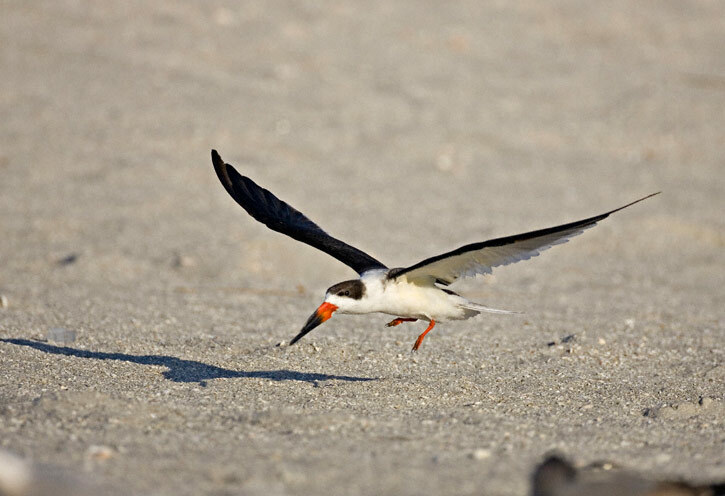 The two shots shown here show Black Skimmers on Captiva Island, Lee Co., Florida, in November, 2006. 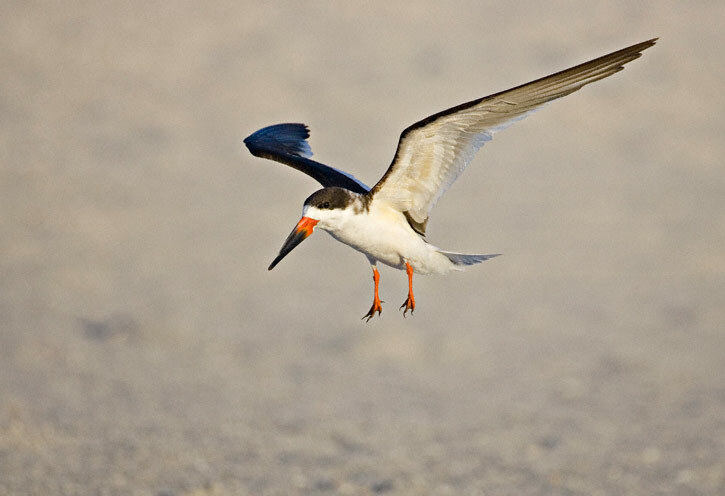 There were digital images taken with a Canon EOS 1D Mark II and EF 500mm F/4 L IS lens. 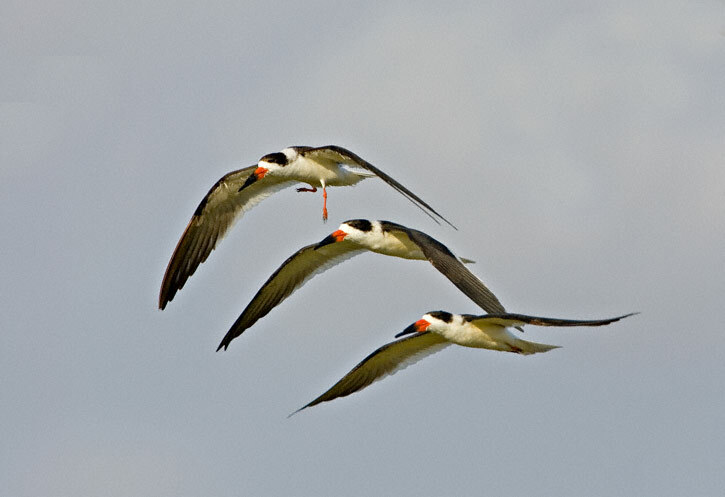 The three Black Skimmers flying in formation were at Lake Kissimmee, Osceola Co., Florida, in February, 2007. 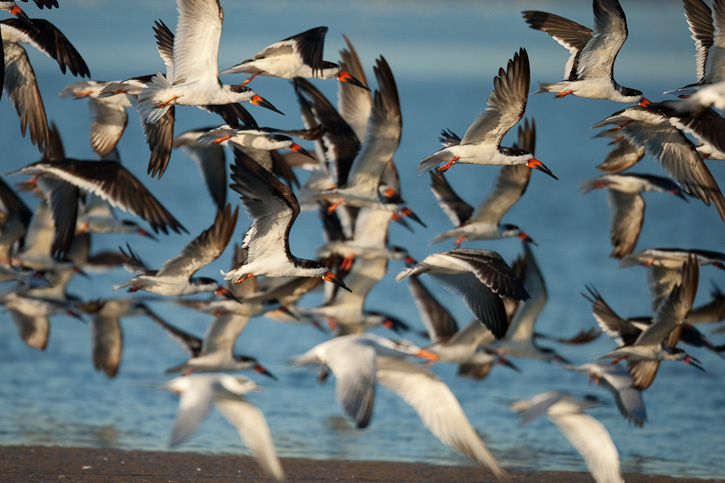 This image was shot with the same gear as above. 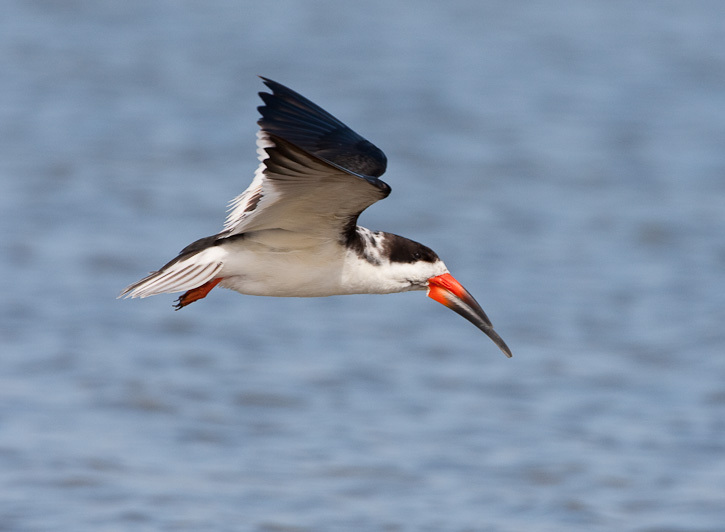 The Black Skimmers in flight shown here were at Bolivar Flats, Galveston Co., Texas, in November, 2009. 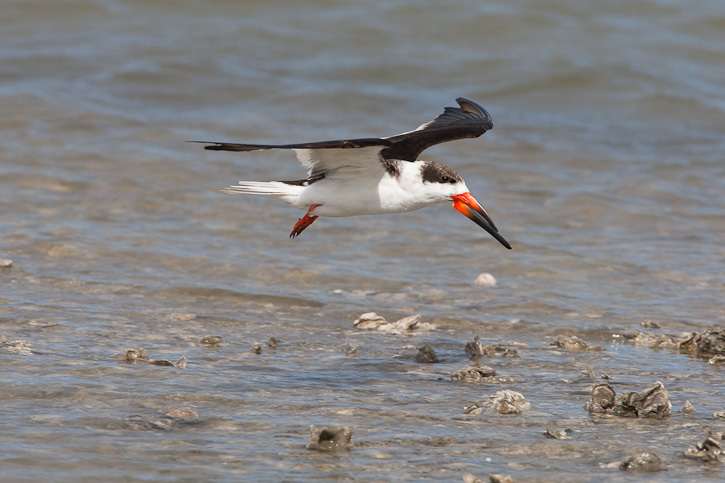 The next 5 images of Black Skimmers were taken at Aransas N.W.R., Aransas Co., Texas, in February, 2010, with a Canon EOS 1D Mark III and an EF 500mm F/4 L IS lens.